Jun. 19, 2015 12:00 p.m.
CMHC senior market analyst Robyn Adamache and Real Estate Investment Network senior analyst Don Campbell were among the speakers at the Urban Development Institute's Fraser Valley forecast forum Thursday. Real estate watchers say condos and townhomes in the Fraser Valley have been left in the dust by rising house prices, a fact largely lost in the public debate about the lack of housing affordability in Vancouver. “You don’t need a million to live in the Fraser Valley,” Real Estate Investment Network senior analyst Don Campbell told a forum in Surrey Thursday hosted by the Urban Development Institute, referring to the social media hashtag #donthave1million used to protest prices in Vancouver. He was one of several speakers who pointed to the different market dynamics in the Valley and particularly the widening gap between the prices of detached houses and either townhouses or condos. “It’s really the detached house market that’s moving prices,” said Robyn Adamache, senior market analyst with the Canada Mortgage and Housing Corp.
She said that while Fraser Valley single family house prices have climbed 15 per cent since 2008 – a relatively sedate annual rate of less than three per cent – Valley townhouse prices are actually down five per cent over the same period and condo prices are down 14 per cent. “For townhomes and apartments, prices are still below the previous peak and haven’t recovered since the financial crisis,” Adamache said. As a result of the two-track market, she said, buying a detached house instead of a townhome now costs roughly $300,000 more in the Valley, compared to $200,000 more in 2009. She said the gap between the cost of an apartment and a house in the Valley has widened from $300,000 to $400,000 over the same period. Adamache predicted the hot housing market of this spring will moderate heading into the fall and price gains will be closer to two to three per cent in 2016. A growing population will continue to power the real estate market forward, she said, citing estimates that 8,500 new households are being formed each year in the Fraser Valley, with nearly 3,000 of them in Surrey and about 1,000 in Langley. Between now and 2031, an extra 500,000 residents are expected – the equivalent of dropping another Surrey into the Valley. Prices of detached houses in the Fraser Valley are also expected to be bolstered by the flight eastward of new families who want the yard with white picket fence but can’t afford it near Vancouver, Central 1 Credit Unon senior economist Bryan Yu said. He and other speakers noted millennials are now about as numerous as baby boomers in the region and their home buying preferences are expected to increasingly influence prices and shape what developers build. Speakers said they saw no evidence of speculators driving the market. Scott Brown, president of Fifth Avenue Real Estate Marketing, said 95 per cent of the 600 multi-family units his firm sold in the Fraser Valley last year were to people intending to live in them – not investors or absentee owners. He said townhouses are increasingly accepted as a more affordable mainstream housing option replacing the detached house. The influence of Chinese buyers is on the rise, Brown said, more so in particular pockets rather than the entire region. He said he’s noticed strong Chinese buying in areas of South Surrey and Maple Ridge that are close to good high schools. Brown predicted that eventually all real estate firms in the region will need at least one Mandarin-speaking staff member. As for the effect on real estate of the outcome of Metro Vancouver’s transit referendum, Brown said developers in the Valley should “keep building” because Surrey will proceed with its light rail network even if there’s a No vote. Campbell stressed the importance of transit and dense lifestyle neighbourhoods to millennials. A unit commands at least 15 per cent higher prices or rents if it’s within 800 metres of a transit station, he said. 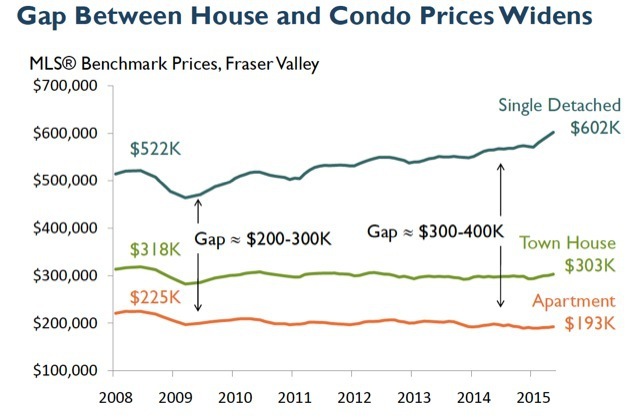 Chart courtesy of CMHC’s Robyn Adamache; Fraser Valley Real Estate Board.